In January I decided this was going to be the Year of the Crochet Garment - I even blogged about it - and I bought a book: Top Down Crochet Sweaters by Dora Ohrenstein and wrote a review on it. I managed to make one garment the Tunisian Entrelac Yoga Top by Elena Fedotova and finish off another the Classic Sweater by Rachel Choi but then was hopelessly distracted by CALs (crochetalongs) and preparing my class on crochet socks for the Houston Fiber Fest. 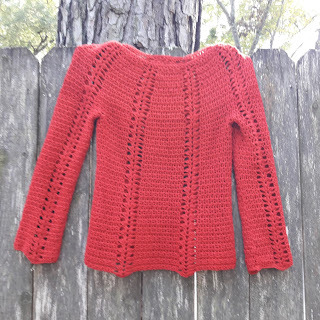 Fortunately Helen, amazing crocheter and blogger at Making at Number 14 proposed that we organize a Crochet Garment CAL and the Back to Sweater Sweater CAL was born so this year has been turned out to be the Year of the Garment after all - and not just my garment which is even better! Pattern: The pattern I chose had to be from my Dora Ohrenstein book having bought it so long ago and raved on about it. I chose the specific pattern I did, Zora, because the stitch design looked fun and I thought the vertical lace and v stitch panels would be flattering. Yarn: I used mainly stash yarn, Rowan Pure Wool 4ply, bought from a super sale at John Lewis in Norwich in the UK visiting my sister-in-law a few summers ago. I bought it because it was in the sale, wool wasn't too scratchy and I liked the color. I didn't have quite have enough and it was discontinued but I found three extra balls from Love Knitting. Progress: My progress has been variable on the sweater. It took forever to get my yoke right. Gauge in the round is not the same as flat gauge. And my gauge swatch was for the v stitch pattern. My yoke had v stitch panels with eight sets of lace stitches between them. My lace stitches stretched a lot, far more than the v stitches. Plus my stitches are wide and short so that was another variable to factor into my calculations. I know I could use the golden loop method to increase the height of my stiches but I stubbornly stick with my shorter stitches. If I was seriously going to get into designing I would probably make a concerted effort to change. Here's a link to a video by Deja Joy Fixing Gauge When Height Is Incorrect AKA Golden Loop Method if you're wondering what I'm going on about. Anyway, after frogging back the yoke three times, I eventually got there. I was not alone though! Over on Ravelry in The Crochet Circle Podcast Group we had a yoke frogging party going on for those who had chosen top down designs. But the bonus of so much frogging was that I nailed that stitch design and consequently the rest of my sweater was fast. I slowed down again waiting for Fay's blog post on Blocking to finish it. I thought I knew everything about finishing and blocking but no, apparently not. So here she is my Zora! 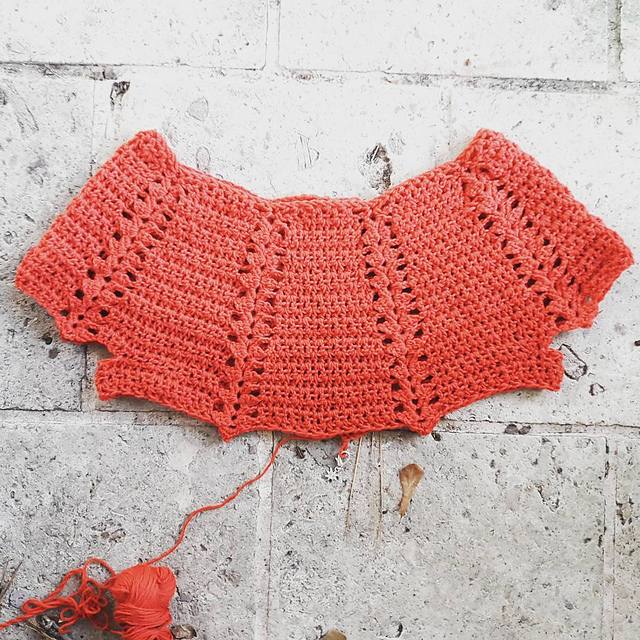 Hope you enjoyed our blog post last week from Marta with Designing a Crocheted Garment. 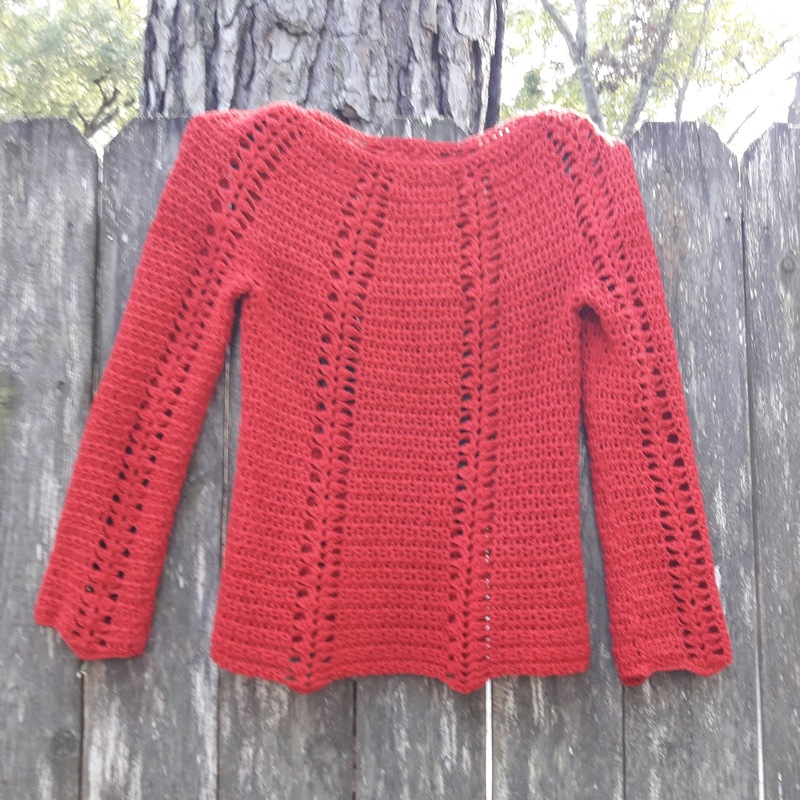 Next week, continuing on our blog hop, we will have a garment in progress blog post from Sam of Sing a Simple Melody. I can't wait! Have a great week y'all! That frogging party was fun! So many of us were ripping out yokes! Glad you persevered - your sweater looks beautiful! Thank you Marta & Helen for your kind comments. It was well worth it and the party made frogging so much less frustrating than usual. Love it, Tamara! I've got the same book and you've inspired me to try a Zora. Marvellous news Emma. If you have any questions about Dora just send me a message on Ravelry. I'm looking forward to seeing your version! Thank you Nicole! It really was worth all the yoke frogging. Good luck with your husband's sweater!